It is always nice to hear from our customers. Here is a review we received from a happy client. Thank you for taking time to tell Angie's List about us. Click on PDF files below to read what our customers are saying about their experience with Badger, Inc. Here is one of our latest comments via ANGIE'S LIST for a project we completed for our client. We thank you for taking time to review our services. It means the world to us. Badger saved our garage! We were seeing our garage slowly but surely tilt and sink into the ground as the slab it was resting on was sinking. This was beginning to cause damage to the structure and the door. We investigated sand/mud jacking, but those options wouldn't work for our garage, and we were referred to Badger by a sand/mud jacking contractor. We were so grateful that his services could be engaged because our next option was to have a new garage built which would've cost about triple what we ended up paying (and eaten up most of the equity in our home in the process). Badger lifted our garage "magically" off the ground, which then allowed for a concrete pouring crew to come in, break up the old slab, and pour a new one. The whole process took less than a week to complete from start to finish, and Badger was an extremely straight shooter with us the entire time. His quote was accurate, and his business practices were sound. One thing I particularly appreciate about Badger over other experiences I've had with other types of contractors is that he never tried to "upsell" us on additional or fancier services than what we had contacted him for. Anyone who has had the "pleasure" of a contractor who is contracted to replace a window but tries to sell you an entire home remodel can surely understand how much of a relief it is to work with someone who simply comes in to do a job and wants to do it done well. Our garage was fixed over a year ago and I can confidently say that there has been plenty of time for any flaws in the workmanship to manifest. This was a flawless job done right by a straight shooter. We originally found Badger through another contractor who highly recommended him. It was challenging to find someone that could lift our sinking garage, stabilize it and put everything back together. Everyone else told us, we would need to rebuild the entire structure. Badger was very fast to provide a quote for the job and we were pleasantly surprised at the cost. Once we agreed on everything and the weather warmed up, the job was very fast and smooth. He sent us before and after pictures as we live across the country, so we would be comfortable. He even worked with our tenant who was living there at the time and was not being the most cooperative. Badger found, scheduled and paid for storage for our tenant only charging us the cost of the unit. We were extremely satisfied with his work and the way he treated us. The garage was turn-key when he left. It is nerve-racking being a country away trying to work on a large project like this. After we hired Badger, we never worried about it again. It is wonderful, and he is an extremely nice guy. We cannot recommend him enough. We would hire again! I would recommend Badger to everyone! —We had a garage slab that had settled over 40 years and was cracking. Badger came in, raised the garage, put in blocks and a new plate and had a beautiful new slab poured. Looks like brand new and we don't have to worry about any more cracking in the future. And above all, the price was very reasonable! Man, this garage "renovation" is the best thing ever. I'm out there working on bikes, and I can find dropped parts. Everything stays cleaner--no dirt in my tools! One thing: the insurance company wants a statement on your letterhead of the cost of the garage door replacement alone, including labor. Can you e-mail one, or drop it by in your travels? Once we get that, we can wind up the insurance claim. Thanks, friend--I appreciate the heck out of what you've done for us! I have a 100-year-old, two story stable/garage, that was leaning badly. The wood sill around the base had rotted away and the previous owner had driven through the back wall. It's a unique old structure and I wanted to save it if possible, but most contractors told me they didn't know how to fix it and that I should tear it down." "I called Badger and he promptly dropped by to take a look. After thinking about it for a day or two he came up with a way that he could stabilize the structure, jack the building up, replace the rotted wood and straighten it out. He also put me in touch with a concrete guy who was able to pour a new cement floor while it was up in the air! When he set it back in place it was as straight and plumb as new. " "Badger has many years of experience moving and repairing old buildings and did a great job for me at a very reasonable price. 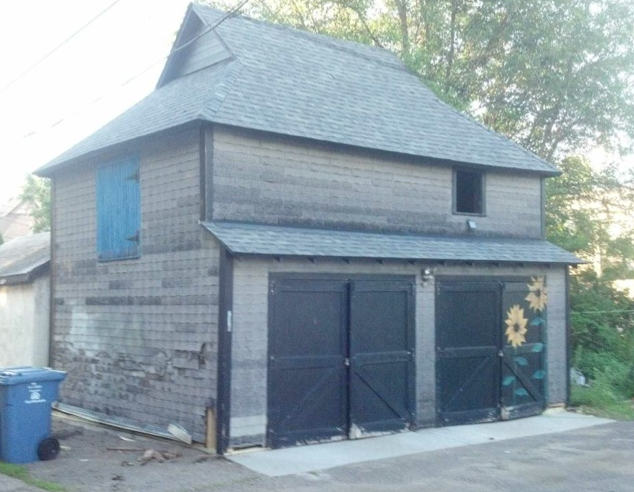 He saved me thousands of dollars by fixing my old garage instead of having to tear it down and build a new one."